Tarkett is expanding its industry leading Safetred safety range to provide the market with a complete solution for floors and walls. There are two new collections, Safetred Ion and Safetred Aqua. The Safetred Ion collection is available in Linen and Contrast. Linen is available in 14 colours with a woven pattern effect designed to be more homely. Contrast is a decorative, three dimensional, multi flake effect safety floor suitable for entrances and corridors and available in six colours. 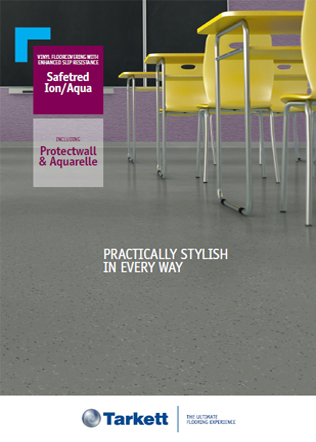 Tarkett’s Safetred Aqua range has an improved specification that includes specially designed top embossing, as well as aluminium oxide particles. It’s suitable for use in wet and dry areas, ideal for the leisure, healthcare, aged-care and hospitality industry. Both Aqua and Ion are manufactured in the UK and co-ordinate with Tarkett’s range of impact resistance wall coverings and accessories. With a TRRL Pendulum test of >36(R10) slip resistance, Ion and Aqua is safety flooring that doesn’t look like safety flooring. I agree to let Tarkett contact me from time to time in regards to the PRACTICALLY STYLISH IN EVERY WAY brochure and related products.